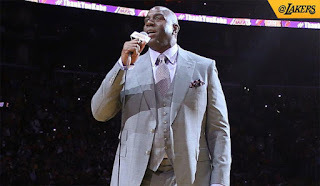 The Los Angeles Lakers have shaken up their front office, promoting team legend Magic Johnson to president of basketball operations and firing general manager Mitch Kupchak and vice president of basketball operations Jim Buss. Jeanie Buss is Jim Buss’ sister, and both took on greater responsibility after the death of their father in February 2013. Johnson was drafted by the Lakers in 1979 and won five titles with the team. He was hired as an adviser to the team in February. Johnson has held titles with the Lakers in the past, including honorary vice president, which he resigned from in June. He has also previously owned shares in the team, which he sold to Dr. Patrick Soon Shiong in 2011.